What happens in Vegas really can stay in Vegas. The boxes are something travelers may have seen before — at least two airports in Colorado, where recreational marijuana is also legal, offer amnesty boxes. But they’re likely to be a bigger draw at the Las Vegas airport, which saw 48.5 million passengers last year. 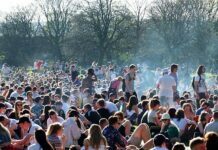 Legal sales of recreational marijuana began in the state on July 1, and they have exceeded expectations. 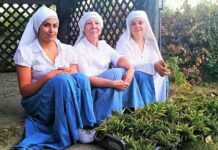 That’s despite a ban on consuming it in public, including the Las Vegas Strip, hotels and casinos. Those 21 and older with a valid ID can buy up to an ounce of pot and use it only in private homes. 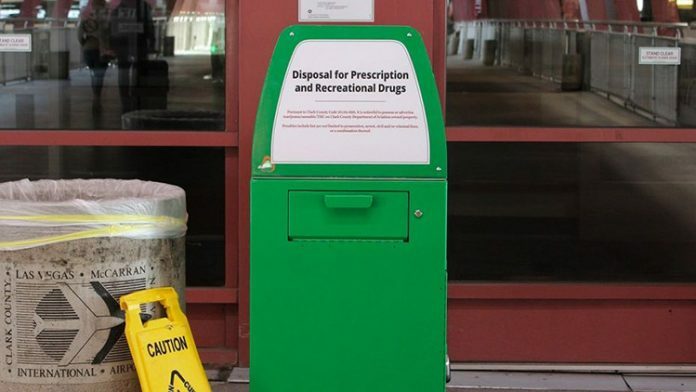 The airport boxes display Clark County’s ordinance and are clearly marked, with a black, bold font stating: “Disposal for Prescription and Recreational Drugs.” They contrast sharply with nearby trash cans. A contractor, not police, will initially empty the boxes multiple times per week and then adjust the schedule as usage patterns develop. Crews said the county aviation department plans to install 20 bins but could add more. In addition to the boxes placed Friday outside the airport, three were set up at the nearby car rental facility. The remaining seven bins will be installed at smaller area airports and other department-owned properties.